Made of Grilamid TR-90, a homopolyamide nylon characterized by an extremely high alternative bending strength, low density, and high resistance to chemical and UV damage. Hydrophilic rubber ear and nose pieces for a no-slip fit. Adjustable ear and nose pieces for a customizable, comfortable fit. Vented lenses improve air circulation, prevent fogging. 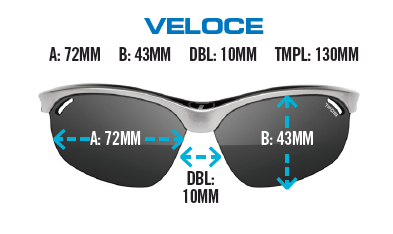 This frame is compatible with the Veloce Rx adaptor. To see how to use, see video here. #1 Direct in Frame. Full lens that is available in non-prescription is made in prescription. Limited prescription range. Available in prescription range of +3.00 to -3.00 with maximum of 2.00 cylinder. #2 8 Base Adapter: Piece that carries the prescription and snaps in place of the non-prescription lenses. Not an insert that snaps in behind the non-prescription lenses. This replaces the lenses so if you want to interchange lenses for various light condtions, you have to purchase another insert and another set of prescription lenses. RX range of + to - 6.00. Prices quoted for Tifosi made lenses. Lenses can also be made with ASFE lab with bifocals and progressives. (8 base curve charge required for 8 base insert option and special edging charges required for half rim option). See see prescription lens options page for all lens options. Estimated processing time: 2 weeks.